Yesterday’s post on the interpretation of some perceived holy mandate to go forth and divide leads conveniently to today’s inspired by one of the more reasonable takes on religion I’ve come across lately. This titled, “The Rabbi Who Believes in Zeus: Why All Intuitions of God Are Incomplete”, comes within spitting distance of rational, although still misses the mark, as it must, being written by one who again makes a living through religion so is therefore obliged to validate the institution. There are realms of reality for which our five senses, our frail physicality, and the current evolution of our minds are incapable of fully grasping. Access to the non-physical spiritual realm is through the gift of intuition, which is a dim remembrance of the world from which we came, and that “speaks” to us in images and metaphors. Like James Watson discovering the reality of the DNA double helix structure in a dream of intertwined snakes, we can access deep truths that appear as symbols and metaphors. There are those who, for a variety of reasons, will concretize these visions and insist that these images are literally true, but the initial vision that brought these visions to us, whether Zeus, a man/elephant, or a pair of snakes, are not descriptions of actual people of objects, but are mystical poetry that contain a truth. That’s pretty, heh? Pondering the meaning of life, searching for said meaning, expanding possible realms beyond the physical … all that sort of stuff … sets us in directions that are, for the most part, good for our souls and keep our brains growing. Coolio. But when the framework is religious it so often ends in a fail. In this way I believe in Zeus, as a human intuition of a true aspect of the Divine. One could ask if I also believe in Santa Claus or the Jolly Green Giant. The difference here is that every adult knows that Santa Claus is an invention to please children, and that the Jolly Green Giant was designed to sell vegetables. Now one can then say that any image of God is also an invention to appease the childish part of our nature that is confused by the world and afraid of death, and that religion was designed to sell mind control and submission. These simple bromides, though, are not supported by the facts of history or people’s real experiences. No adult has come to a belief in and develop meaningful connection with Santa Claus, while countless people have come to find truth and relationship in their tradition’s interpretation of the unknowable realm of Spirit. And no one has ever struggled with the obligations to be charitable and compassionate as demanded by a can of peas, while billions are elevated by and supported in a religious community and tradition that feeds the poor, cares for the ill, and comforts the bereaved. And THAT’S where if falls apart. “Elevated and supported”? Maybe, and pie-in-the-sky can do that, but the “feeds the poor, cares for the ill …” biz is what yesterday’s post was all about, and religion does a crap job. Trotting out those old chestnuts should no longer be tolerated and Brownie points for altruism no longer awarded to tax-exempt organizations sitting on billions, yet sucking pennies from the poor. As far as my grasp of history goes, I can’t come up with one single instance of Santa or the Green Giant bringing on a genocide. Heck, not even one little skirmish inspired by Mr. Claus or Jolly Green pops into my head … aside from my brothers wearing out the batteries on my kids’ Star Trek communicators one Christmas Eve which caused a bit of a tiff … but wars based on “my god’s better than your god” are easily recounted. Yes, terrible things, like child sacrifice and abuse of women, were done as “religious” acts to appease imagined gods, but these were acts of barbaric cultures disguised as spirituality, and have been — and are being — eradicated as we evolve. There, for me, is the salient point … the fact that barbaric cultures can and do use the cloak of spirituality to disguise and excuse just about anything. I have far less ‘faith’ in eradication than the good rabbi, and feel if religion came with caveats rather than gravitas many barbarians would find themselves naked and exposed for what they are, rather than idolized for their vision, leadership, conviction to belief… whatever. The carte blanche so often automatically conveyed to religion, the knee-jerk acceptance of religion as a good thing no matter the evidence to the contrary, the insistence that there is not only a value but also a need to believe, all perpetuated by those with a vested interest in maintaining the status quo is what prompts me to to clang this bloody bell of mine as often as I do. 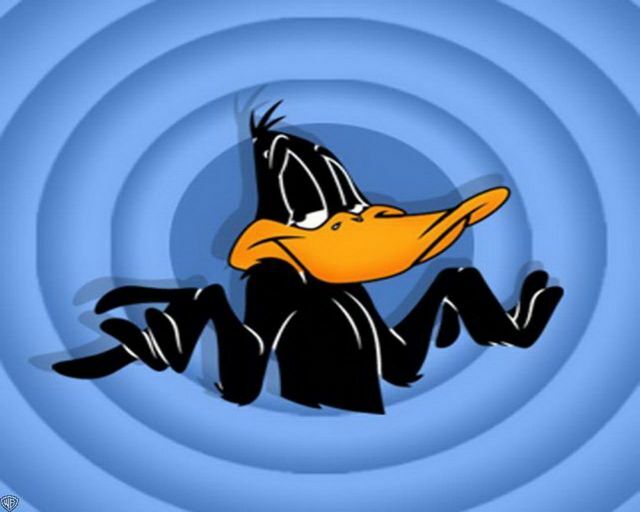 As for those who do feel that need, I’m thinking Daffy Duck would look mighty good on an icon. No need to spend a fortune on gold-threaded robes, either. He and Donald might not get along, but the most their followers would have to throw at each other would be a few lisps and quacks. And the Word According to Daffy … well, baptism would no longer require a font.